I was telling people last night that he was 25, but he’s really 31. (Where did I get the idea that he was 25??) 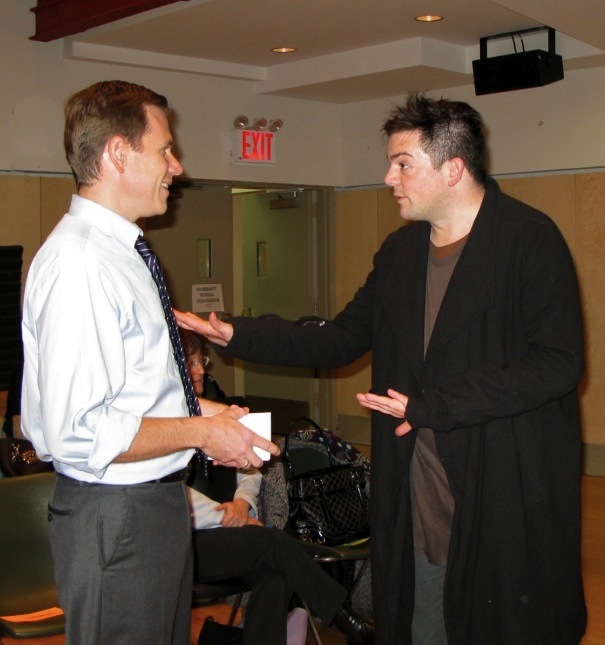 His first full-scale opera, Two Boys, which premiered in London in this spring, will be performed at the Metropolitan Opera next year. I can’t imagine having that kind of success so young. First, I can’t imagine writing an opera. Writing music is a mystery to me. I’ve tried it and honestly, I couldn’t summon anything, I have no clue where music comes from. Words, they’re in me. Original music, not a single freaking note. (Thank you very much, Universe.) Then, I can’t really imagine sitting in one of the front rows, or offstage, to see something that was inside me emerge in such splendid display in that venue? Yeah, I’d explode. We’re doing a piece called Senex Puerum Portabat, and I’m singing what’s called the drone part. It’s surprisingly difficult and I’m not sure why, because on paper it looks like the least challenging part. But I can see why he’s a star. The piece is so completely original, although he talks about his influences here, and yes, we all have them, but if you focus on that, how can you listen, read, taste, look at anything? I hear and feel a new musical mind, and if I was going to get distracted at all it would have been by that, because this piece is really really smart. But I don’t. There’s one part where we sing at whatever tempo/rhythm we like, as long as it’s different from the people around us. It should sound like a mess, but it does this pulsating, expanding and contracting … thing. It’s like a singing choir traveling through a bunch of different universes, and the sound warps and changes depending on the physics of the universe they are in at the time. It’s an incredible result for such a simple thing. But why he does this is even better. He wants us to represent a crowd of different ages, sizes, genders, backgrounds, all proclaiming Gloria in excelsis Deo (Glory to God in the highest) each in our own unique way. Pretty cool, huh? So even though there’s obviously a constantly thinking mind in the piece, (to have even conceived to try such a thing) in the moment it effectively moves from spookiness, mystery, tenderness, love, to exaltation. 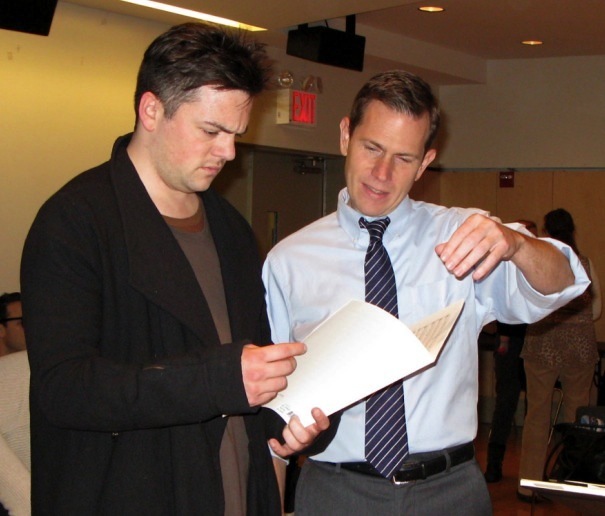 Here are a couple of pictures of Nico Muhly with our choir director John Maclay.